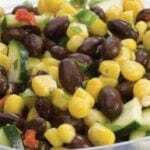 Three Sisters Salad | JPMA, Inc.
Add corn, zucchini, cilantro, lime juice, and jalapeño (optional). Stir to combine. Serve right away or refrigerate for later.